The most popular on-line tutorial for Jini, Sun's Java based technology that makes transparent distributed computing possible. This is the most popular on-line tutorial for Jini, Sun's Java based technology that makes transparent distributed computing possible. The tutorial is up-to date with the advances in Jini technology announced at the recent Java One in June of 2000. Newmark shows us how to transform hardware devices into Jini services, and how to use all the latest utilities and services of the newest version of Jini. He describes, in complete the detail, every aspect of Jini use. Also included here are the coverage of important topics such as how Enterprise Java Beans fit in with the Jini framework and how CORBA fits in as well. 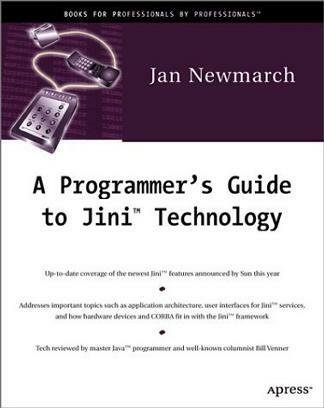 :) "Among the JINI books, this book can be considered as very informative to learn about JINI technology."